One of Germany’s major power grid operators, Tennet, announced it is “massively increasing power grid fees” and that “power is going to be more expensive“. This is another setback for German power consumers, who have seen their power bills explode since Germany enacted the renewable energy feed in tariffs into law as part of the Energiewende (transition to renewable energies). Average electric power rates for German households in €-cents. The largest cost driver by far is the feed-in tariff for green energies. Source BDEW. German power used to be affordable, and highly reliable. But all that has changed since climate hysteria and the green movement took over 15 years ago. Today German power is among the most expensive worldwide. For a three-person household, this will mean another 30 euros burden annually, says Keussen. Moreover the highly volatile wind and solar energies have made the German grid highly unstable and have recently seen it on the verge of collapse. The major problem is that the power grid has been far from adequately expanded to accommodate the briskly expanding solar and wind energy capacity, thus leading to gigantic transmission bottlenecks and massive grid instability. FOCUS adds that in 2015 alone “bottleneck management” led to costs totaling about 1 billion euros. sod will come back and say the higher pricing won’t matter because Germans will use less electricity. Mass abandonment of the grid is part of the green agenda anyway, even if it does increase pollution through use of inefficient wood burning stoves and heating. More likely he’ll say “what higher pricing?” and try to convince us that prices are coming down, and becoming so competitive that they are driving conventionally fueled generators out of business. At least that’s what he’s done before. Do not worry. Support for children gets increased by 2 euro per month, so people can live on. Govt takes 20 and gives them back 2. What a fool you are if you believe it’s good for them. If I got the exchange rate right Germans are paying ~$0.33/kVAh which is more than three times what I pay in Florida ($0.10/kVAh). If you have poor people in Germany this must be hurting them while undermining your industrial competitiveness. No, it is not,. Because you are using 3 times as much as the Germans are using. So we pay EXACTLY THE SAME. OMG, poor sop doesn’t know the difference between a rate and a total. I do. But for a family, the important number is the end price at the end of the month or year. And wasting energy (air conditioning keeping one corner of the room cold, while the wall on the other side is letting heat in) is just plain out stupid and not healthy, by the way. it is a serious problem for them. You do realize that we’ve been waiting for that? An egg in Venezuela costs 25 US Dollar at the moment. But it’s no problem. Venezuelans just eat less eggs now. You are just wrong again. My LED lights give exactly the same light as your 100W bulb does. But they use only <10% of the electricity. I get the same result, even if the price per kWh SEEMS TO BE HIGHER. Well and a Midwestern US citizen gets 3 times as much as you still. Reality – it’s the thing that refuses to go away even when you don’t believe in it. sod. I need a house slave who works for one third of the minimum wage. I hear you are game. Come on over. The LED does exactly that. Have you changed all your lights already? Apart from that, i am really shocked. You really believe what you are saying. So let us take a look: Minimum wage in Germany will raise to nearly 9€ next year. So you are looking for labour at 3€ per hour. While you can barely live of mindestlohn already (9€ *40h *4 weeks = 1440€ per month)your third of that (480€ per months) will not even pay your rent. So your idea, that 3 guys at 1/3 of mindestlohn will do the same work as 1 guy on the full mindestlohn is totally wrong (they need 3 of these jobs and could neither eat nor sleep)..
You misunderstand me, sod. You will work for 1/3 the wage and simply consume 1/3 as much, meaning, you will be perfectly happy. Also, always remember, it is for the common good. Many of us are familiar with “sod’s law” [AKA Murphy’s Law]. Now we have “Sod’s Logic”. It goes like this. Someone pays three times the price for a particular product than another person does, but because the person who pays the higher price uses one third less [perhaps exactly because of the high price], both parties pay exactly the same price. Sods Logic… Both their power bills are costing the same! Sod’s assumption… One person is thrifty with led bulbs while the other is wasteful with incandescent bulbs. Perhaps sod doesn’t realise he, she, or it, does not have a monopoly on led bulbs, or brains for that matter. Perhaps sod doesn’t realise Watts are a unit of power, and someone paying one third less per Kw/hr has the ability to convert three times as much energy into useful work as he does! No… you pay three times their price. Can’t you use your brain anymore?? We import them from Arabia. To the electricity companies this is a dream, captive customers, brainwashed into thinking they are saving the planet, forced to pay ever more for this unplanned “transition” that they never needed. I have serious doubts that this increases will withstand the backlash. If you are running infrastructure and you have to increase the cost by 80%, then you are basically saying: I did not do my job over the last 10 years at all. “…Tennet kriegt seit Jahren die Anbindung der Nordsee-WKA-Parks nicht in den Griff. In den letzten 5 Jahren wurden nicht mal 500 km im Netz ausgebaut. In einem so 1,8 Millionen km langen Netz! In diesen letzten 5 Jahren haben die Netzbetreibert sage und schreibe rund 80 Milliarden Euro eingenommen, für Unterhalt und Ausbau. Wenn nichts ausgebaut wird, wozu Netzkostenerhöhung? Why would a journalist in Hamburg working for the tax evading foundation of Liz Mohn, the Bertelsmann foundation – which was founded with the explicit purpose of evading taxes – know anything about energy? Explain. What rot. You continue to close your eyes to the fact that intermittent, unreliable generators have been forced into the infrastructure, making it almost impossible to run. If anything, the grid operators have been doing their job too well, masking the issues that renewable generators have caused. Letting the grid fail earlier when less damage to infrastructure (plant closures) and less wasteful expense into renewable generators and supporting systems would have saved Germany a lot of money. The ones who have not been doing their jobs over the last 10 years have been the politicians and their advisers who created the policies that allowed this stupid situation to develop. No, they have not. The companies running the grid a re mostly split offs of the big power companies. They have done a horrible job. Their job is, to plan what will happen in the future and to prepare for it. They totally failed to do that. You idiot. How are the operators supposed to plan for chaotic, intermittent power production? And please detail how separate pricing and “economics” will stabilise the grid when it is the distortion of economics via mandates and subsidies that has led to this mess. Yeah, they just predict the future state of a chaotic system. Greens are so adorable. But remember: Keep them away from any position of influence. The ultrataxation-unity front of SPD and CDU stole so much money from the productive that they don’t know where to squander it all so they decided to give rich people who buy electric cars some of the money. Just like the “progressives” in the USA. Well the Berlin crooks wouldn’t develop an idea of their own if their life depended on it. How many more wind farms need to be built before we prevent our first drought? I am really glad, that you folks here are so interested in energy cost to people. You must be reallö angry about the Hinkley point nuclear plant then, which will cost the average family 1000 pounds, instead of 30 €. Yes we are. We have been taken to the cleaners by the French and Chinese. We could have had a much cheaper nuclear station for much less cost. It joins the ranks of all the bloody expensive and useless wind turbines we have in the UK. At least Hinckley will produce reliable power. But just think how many wind turbines you could buy for the price of Hinkley Point. You could litter the whole of the UK with them! Imagine a new era of unsustable, unrenewable, unreliable, unaffordable, utterly useless de-industrialized Britain. But I guess you would like to selfishly get your power 24/7/365 from Hinkley Point nuclear plant (for about 50 years or longer). Those these numbers account for inflation? 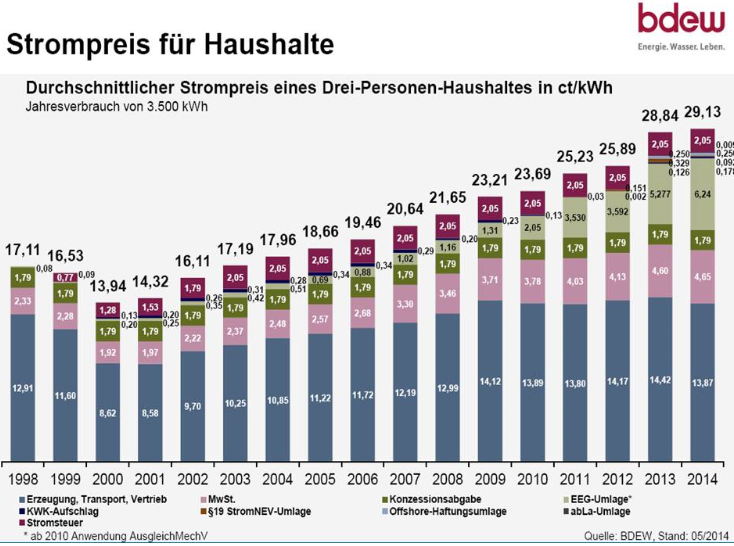 Here is a chart of increasing annual electricity prices in Germany. I translated the German into English. The electricity prices increased from 13.94 in 2000 to 29.13 €cents/kWh in 2014, which is a 109% increase in 14 years. This may be useful to counter those who claim wind and solar power results in lower electricity prices. “sod” sees nothing wrong with paying $0.33 per kVAh. So how much do you folks pay for petrol (we call it gasoline)? Right now I pay $1.98 per US gallon which works out as 0.47 €/liter. How much are you paying in Europe? About 3 times as much. Reason is a constant levy of about 70 cents per liter – the “Mineralölsteuer”, recently renamed to “Energiesteuer”. And 20% VAT on top of it all. It’s a huge source of funding for our bloated government. Do nukes have to cost that much? Currently there are AP1000s under construction in the People’s Republic of China for $2 billion each or half of what a similar installation costs in the USA. It is thus inevitable that the PRC will soon have a fleet of shiny new nukes while the USA clings to its shabby “Old Nukes”. I see this as a metaphor for excessive regulation destroying innovation and with it the prosperity of our children. Of course they don’t “have” to cost that much. The problem is the regulatory bodies in the west like the NRC in the USA and the ONR in the UK place a huge administrative and legal overhead for any reactor type approval and also for any reactor deployment. On the Euan Mearns site, Roger Andrews provided some analysis on nuclear deployment costs in various countries over the past 40 years. The overriding conclusion was that nuclear costs as much as a country want to make it cost.